In 2016 Radio Flyer established today’s holiday in anticipation of its 100th anniversary in 2017. That’s one hundred years of children enjoying the imaginative outdoor play a little red wagon provides! Whether kids are transporting their siblings, giving their pets or toys a ride, helping out in the garden, or participating in a community parade, the red wagon has been at the center of the action and a plaything that gets passed down from parent to child as a family grows. If you have little ones in your family, celebrate today by taking a little red wagon for a spin. When Lucy got a new red wagon, “she wanted to play with it immediately.” Her mother thought she could take her wagon to the market. That didn’t sound like much fun to Lucy, but she headed to the market with a list anyway. When she came to the big hill, her friends Hedgehog and Squirrel jumped in. That made the wagon “pretty heavy.” Fortunately, Rabbit came along to help push. At the top of the hill, they stopped for a snack with Bird and Raccoon, but “it started to rain! Oh, brother.” Lucy pushed the wagon to the bottom of the hill, but by now the rain was a torrent. That was okay, though, as the wagon had transformed into a ship, and Raccoon, in his umbrella, had become a pirate captain. 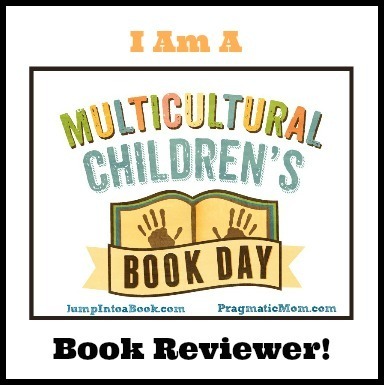 Copyright Renata Liwska, 2013, courtesy of Philomel Books.com. 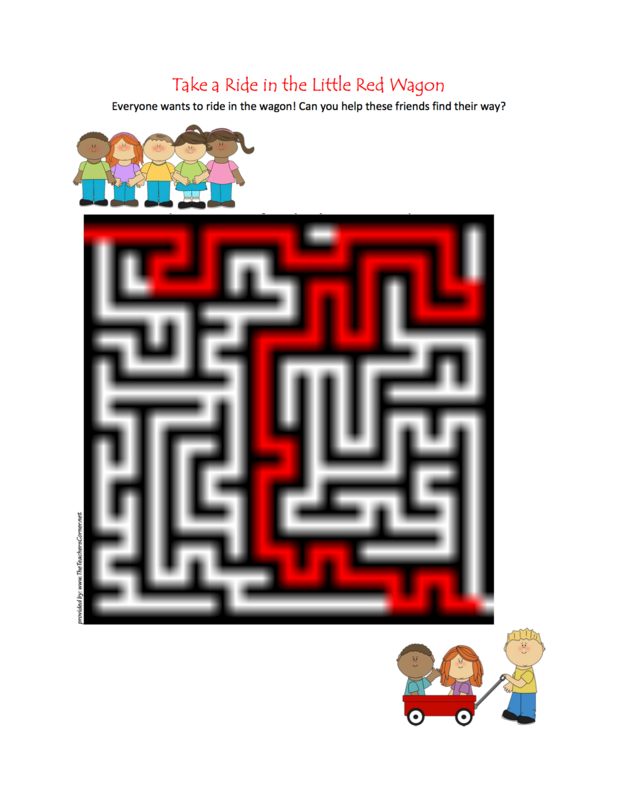 When the rain stopped, the friends went on their way in their red Conestoga wagon. Bunny, in his ten gallon hat, pushed while Sheriff Lucy pulled. Hedgehog held the reins, and Raccoon road her horse alongside. “At last Lucy arrived at the market.” As Hedgehog rolled their circus wagon into the center, Bunny toddled tall on stilts, Lucy juggled rings, and Raccoon blew a horn. Lucy gathered all the vegetables on her mother’s list and started toward home. The train engine chugged, pulling the vegetable car up the steep hill. They were almost home “when the wagon hit a rock” and rocketed into space amid vegetable planets. When they landed, Lucy “gathered the vegetables and put them back into her wagon. Lucy’s mom was happy to see her when she got home and thanked her happily for helping. “Finally, Lucy was free to play with her wagon,” which now made a perfect spot for a nap. Snuggling up with your little one and Renata Liwska’s Red Wagon is such a sweet way to spend story time. As young children so often do, adorable Lucy turns a chore into imaginative playtime as she and her friends rapidly use mishaps, bumps, and their changing surroundings as springboards for their supple creativity. Liwska’s simple story is the perfect frame for her beautiful, soft-hued, and detailed art as this group of cute friends become cowboys and cowgirls, sailors, pioneers, circus performers, and mom’s helpers. A rich story for the youngest readers, Red Wagon would be a perfect baby gift and a much-loved addition to any toddler’s bookshelf. To view a portfolio of books by Renata Liwska, visit her website. Everyone wants to ride in the wagon. 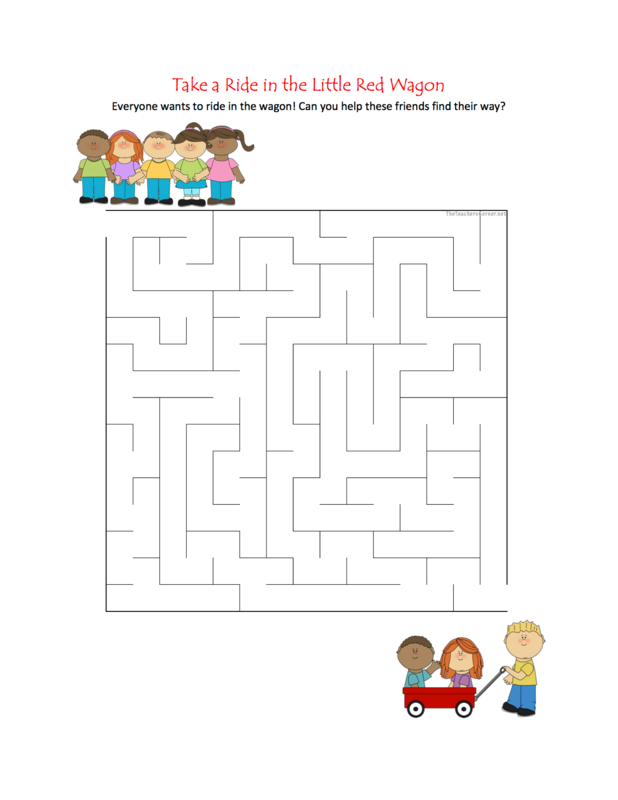 Can you help these friends find their way in this printable maze?